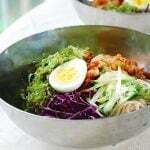 Bibimbap is a versatile dish. We make bibimbap with just about anything – leftover side dishes, kimchi, wild mountain vegetables, etc. This spring, I’ve been enjoying this simple version made with some of my favorite spring vegetables and canned tuna. You can substitute any of the vegetables with your favorite vegetables. For other variations, try salmon or tofu instead of the tuna. 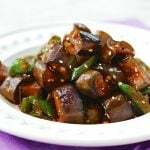 A gochujang (red chili pepper paste) sauce is usually used in traditional bibimbap, but a soy sauce-based sauce works wonderfully with this dish. 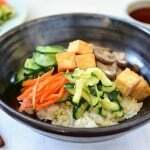 Hope you enjoy this quick bibimbap recipe for a healthy spring meal! Thinly slice the asparagus, carrots, lettuce and scallion into bite size pieces. If the carrot is thick, cut in half lengthwise first and then thinly slice diagonally. Cut the radishes into match sticks. Cook the peas in salted boiling water until cooked through, 6 – 8 minutes (less if frozen). Heat a lightly oiled pan over medium high heat. Separately sauté the asparagus then carrots for a minute or two. You can sauté the scallion briefly if you like. The vegetables should be crispy. Place a serving of rice in a big bowl. 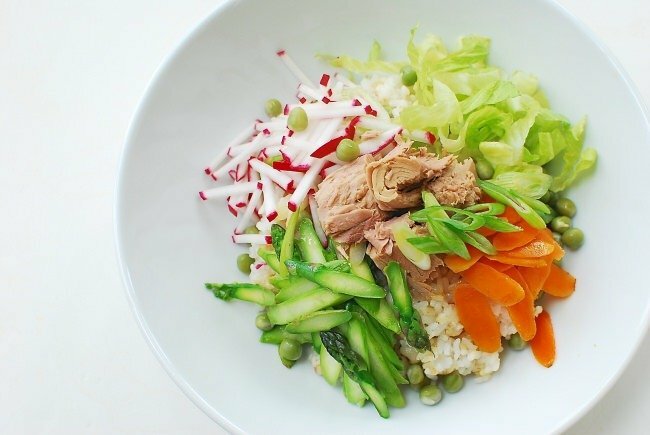 Nicely arrange a small amount of each vegetable and tuna over the rice. Serve with the sauce. This Spring bibimbap look fresh and delicious. I love the combination that you put together. Thank you for sharing and have a lovely day! This spring bibimbap sounds so good! This looks fresh and healthy! Will try for sure. I love the different spin you put into traditional Korean dishes. 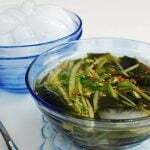 Can you also do one for kal guksu? 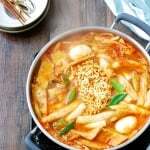 My husband and I are Korean newlyweds and needed help on how to cook Korean food for dinner. We both have been using your blog as a major tool. Love your recipes! Tried like 10 of them. Thank you! 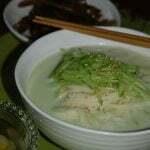 Hanna – Kal guksu is on my list. Hopefully I get to it soon. So nice to hear you both cook Korean. Thanks for using my recipes! We have a similar dish in the middle east but its rice mix with less vegetables. I would like to ask you if you have a recipe for sticky rice with beans? i saw it and the beans seem to be cooked very well with the rice that they are blended together? Beautiful variation on bibimbap! Always a pretty dish, but the radishes make this one exceptionally so! Thank you, Irina! Hope you try it. just found your site!! thank you for sharing these recipes, i hope to try some soon. 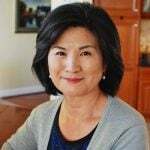 i’ve been watching the Kimchi Chronicles and started searching for recipes and found your blog….found several things i’d like to try. Thank you, Sharon! Hope to hear how the dishes turn out for you. Happy cooking! HI HYOSUN, first time I’ve seen asparagus used by the Asian people. I was just saying I would like to see a recipe with asparagus. 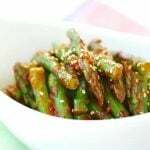 I have some other recipes with asparagus. Hope you check them out.